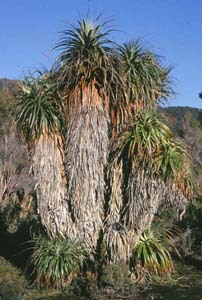 Richea pandanifolia (Pandani) is one of the most distintive species in the Tasmanian flora. It is an erect shrub or small tree with very long (usually 1m or more), tapering, strap-like leaves. 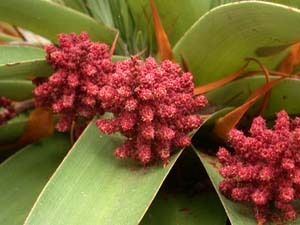 It grows in alpine areas in central, western and southern Tasmania, and in rainforest in the south-west. It is often almost unbranched, but damaged alpine plants and a lowland subspecies can be quite branched. Pandani can be confused with the rare species Dracophyllum cf milliganii, which grows in the south-west, often with Pandani. Pandani has inflorescences in the leaf axils, whereas the Dracophyllum has obvious terminal inflorescences. The leaf margins of Pandani are very finely serrated and cutting, whereas those of the Dracophyllum are smooth. This species hybridises with Richea scoparia to produce what is called R. Xcurtisiae.